Please take a few minutes to complete the survey linked below about the qualities you think are important for the next principal of our school. The Principal Selection Committee will use the input to develop criteria to screen principal candidates. The deadline for completing the survey online is May 3rd. Plan meetings with their counselor. Appointments will be held April 1 - April 18 and April 29 - May 3.​ You can call the Guidance Office to set up an appointment. Florence School District Three will host a Parent Academy, featuring five resource courses for parents, guardians and community members. The Parent Academy promotes parental involvement and the enhancement of student achievement. Classes within the Parent Academy will promote student achievement, parenting, advocacy, personal and individual growth. Parent Academy will take place on Thursdays, October 11, 2018 through November 8, 2018. The Parent Academy will be held at several sites, including J. C. Lynch Elementary School of STEM, Main Street Elementary School of Arts and Olanta Creative Arts and Science Magnet School. Each five-week course is free with no fees to participate and childcare will be provided. All participants will receive a certificate. Participants attending all five sessions will receive a completion certificate and a special gift. The Parent Academy is funded from Federal Title I funds. For questions or to register, contact your school’s Parent Liaison or Ms. Theresa Burgess at (843) 374-8652 or taburgess@fsd3.org. 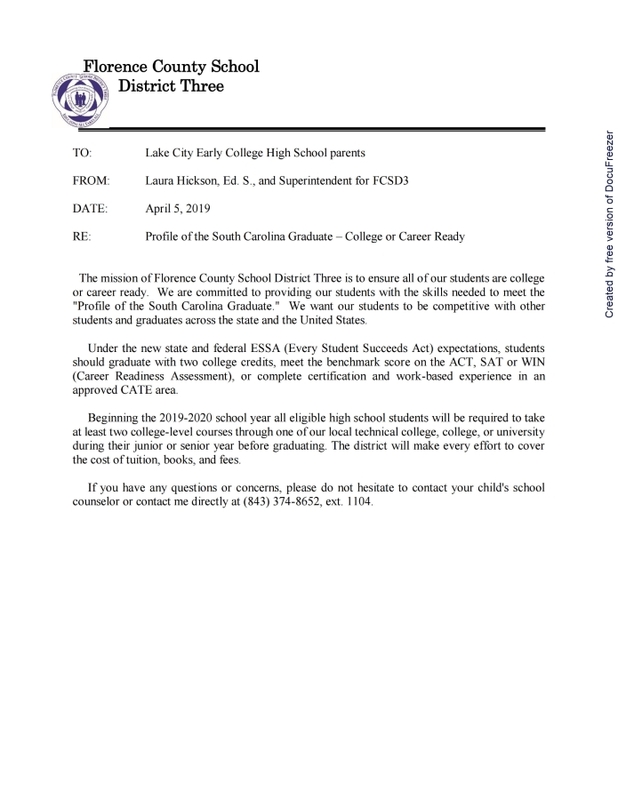 The Lake City Early College High School Career and Technology Center, in partnership with Williamsburg Technical College, will have three new course offerings for juniors and seniors this year! Students who are interested in Welding, HVAC, or child care and have at least a 3.0 Grade Point Average can see Mr. Leon Burgess in the CATE building for the application. Students will also need to contact their school counselor immediately to make schedule adjustments. Students will be bused to and from Williamsburg Tech and the programs are offered at no cost to the students. Please identify the course you are interested in taking when making contact. These classes begin next week, and space is very limited. Thank you.